Ratha Sapthami is a Hindu Festival which is celebrated on Shukla Paksha Saptami tithi (7th day from Amavasya) in the Maagha month(Jan-Feb). It is believed that Lord Surya started enlightening the world on this day and considered as the birthday of GodSurya born to sage Kashyapa and his wife Aditi. Ratha Sapthami is also called as Magha Sapthami, Surya Jayanthi, Maha Sapthami or surya saptami. Ratha Sapthami falls on the next day after Vasanth Panchami. The tithi Sapthami is dedicated to God Surya. 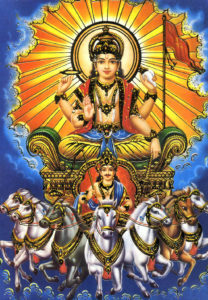 Lord Surya Bhagavan placed in the center of nine planets (Navagrahas), because Surya is considered an important god because he is the source of life. God Surya is worshipped early in the morning when fresh sunrays emerge. Exposure to fresh sunrays rejuvenates energy and purifies the mind & body, it believed from the ages and proven scientifically. Ratha Sapthami is the highly auspicious day as Surya Grahan for donations to charities and also symbolic of the change of season to spring and the start of the harvesting. It is an auspicious day for the Indian farmers, the festival is celebrated by all the Hindus in their houses and temples dedicated to God Surya. Ratha Sapthami symbolically represents that the sun god Surya turning his chariot drawn by seven horses towards the northern hemisphere in the north-east direction. The significance of the Ratha and the seven horses (seven horses named Jaya, Ajaya, Vijaya, Jitha Prana, Jitha Krama, Manojapa, Jitha Krodha) represents the seven colors of the rainbow. Seven horses represent the seven days in a week starting from Sunday (Day of God Surya). The chariot has 12 wheels which represent the 12 zodiac signs constituting a full year called “Samvatsara”. It is believed that the seven types of sins done “Knowingly”,”Unknowingly”,”By Words”,”By Mind”,”By Body” and the “Sins done in Last Birth” can be get rid by worshipping lord Surya Dev and by observing fast on this day. The most important ritual of Ratha Sapthami is taking bath before the sunrise during Arunodhaya time which prevails approx one and a half hour for Indian locations to keeps one healthy and free from all types of ailments and diseases, hence it is called as Arogya Sapthami. Taking bath in water bodies like rivers, canals is preferred over taking bath at home. According to Bhavishya purana, it is believed that God Surya posses seven rays and Ratha ( Chariot)drawn by seven horses named Jaya, Ajaya, Vijaya, Jitha Prana, Jitha Krama, Manojapa, Jitha Krodha. On the day of Ratha Sapthami formers drive well decorated Bullock Carts around the temples in their villages by offering prayers to their village god and lord surya Bhagavan. 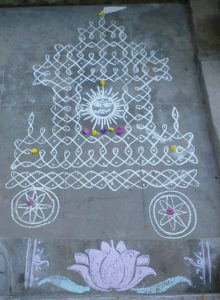 People draw Chariot (Ratham) designed Kolam in front of their houses to welcome god surya for better health & wealth. On this day one day Brahmostavam is held presiding deity of Lord Malayappa Swamy along with his companion Sridevi and Bhudevi carried out around the Thiru mada streets encircling the holy Shrine of Balaji on seven different vahanas, staring with Surya prabha vahanam in the early morning followed by Chinna sesha vahanam, Garuda vahanam, Hanuman vahanam, Charasananam, Kalpavriksha vahanam, Sarvabhoopala vahanam and ending with Chandra prabha vahanam. Lord venkateshwara will bless the devotees for about an hour in each vahanam in the Thiru mada streets of Tirumala. 7 types of vahanas on the streets of temple (Madaveedulu).